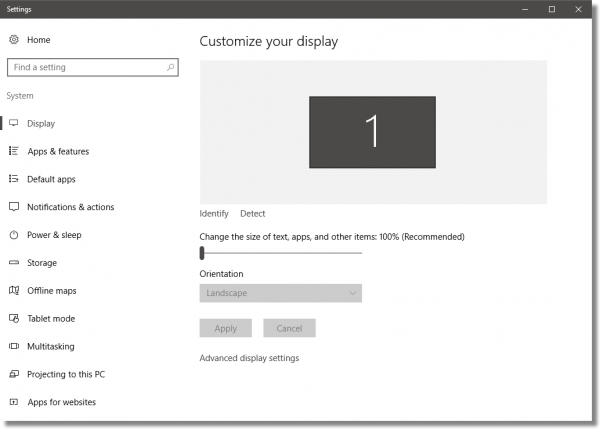 Adjust the Size of What's on Your Screen in Windows 10 - Ask Leo! A common request (or complaint) is that text or other items on the screen are too small to be seen clearly. There have always been ways to adjust the size of items displayed, but they’ve been somewhat obscure and occasionally something less than reliable. Windows 10 made this a lot easier. Right-click on an empty area of the desktop and click on Display Settings in the resulting popup menu. This will bring up the Settings app, opened to the “Customize your display” page. Near the center of that page is a slider labelled “Change the size of text, apps, and other items”, set to some default value. 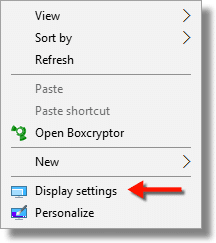 “Recommended” simply means Windows has determined this setting to be optimal for your display type; items display with the least amount of distortion due to scaling. Using the left mouse button, click, hold and drag that slider to the right to make things bigger, or to the left to make things smaller. When you release the mouse, most items on the display will resize to your new setting. Note that the range available to you will depend on what your display is capable of, and the abilities exposed by the display device driver. You can experiment and adjust the size to your taste. Depending on your display type, you may find that some things look a little fuzzy after changing this setting to a non-“recommended” value. If this happens, you can choose to live with it (it harms nothing on the computer), or try a different setting. Note also that it is possible to size things so big that poorly-behaved applications don’t display properly. If this happens, simply return to this settings page and adjust the size a bit smaller. Why Does My Screen Go Black After the Windows screen When I Boot? - It usually means your desktop settings don't match your video card's or your monitor's capabilities. How Do I Adjust the Brightness of My Screen in Windows? - Adjusting the brightness of a monitor or display can often be done right on the display itself. Sometimes it's also possible to adjust the brightness in software. Making Things Look Bigger in Windows 10 - Windows 10 makes it easy to make things bigger on the screen. « Previous post: Should I Run CHKDSK on My SSD? So is this slider changing the resolution or the DPI setting? They’ve dumbed it down, which is great for non-geeks, but for those of us who have been using computers for a long time (640×480 was the earliest resolution I’ve ever used), we’re used to making adjustments to the resolution (or I helped someone on Windows 7 by adjusting the DPI setting). It would be nice to know what it was that I was doing. Resolution is nearly synonymous with DPI. Screen resolution is measured in pixels per inch. Image resolution is measured in DPI (dots per inch). Maybe DPI was the wrong term. In Windows 7 and I believe XP you could adjust both resolution and something else that said it made things bigger. The choices were 100% or 125%. Indeed, I do believe this is the DPI setting. An important distinction here: This will change how many pixels fit across a screen. So it affects everything you see. But many applications allow you increase/decrease how much you see inside the Window that there application is running. This is usually done by holding the button, while scrolling the wheel on your mouse. So if only one application is at issue, you may want to fix just it. It pays to buy a quality monitor. On my $100 monitor, the the far end of the slider is 125% and that is the extent of the adjustment. CTRL > – decreases size. Only within applications that support it. These do NOT change the size of things displayed by Windows itself. thanks! just what i was looking for!! If by “easier” you mean dumber, yes. Windows 8 and 10 more so have dumbed down a lot of the control that users had over the Windows UI. My current pet peeve with Win10 is how impossibly narrow the Application Window borders have been made. We used to be able to adjust that setting, but MS has removed it from the UI. I did have a Windows desktop theme that made that better, but caused other issues. So since it still can be adjusted there must still be a registry entry for it. Does anyone know what it is? Not really. If it’s a problem with the video itself (and it usually is) the only solution I’m aware of is to download it and then edit it in a video editing program that has that capability. Not easy. I use Windows 7. Reading between the lines, what this article seems to imply is, in fact : so-called high DPI scaling issues have been plaguing Windows for years, and Windows 10 still does not address them. Basically, the issue is this : on too many programs, either you get a lousy, unreadable interface which makes using the PC a thoroughly unpleasant experience (exceedingly tiny fonts and icons, interface text partly hidden, disharmonious text spacing, broken fonts), or, if you’re lucky and this is at all possible, a normally-sized interface, but completely blurry. This is taking us back decades on the usability progress timeline. It’s arguable that text-based interfaces from the good ol’ days, à la WordPerfect, were better, more user-friendly, than this horrendous mess for which Microsoft will, one day, have to stand trial before the World Court for Crimes against Computer Users. The latest update for Windows 10, the Creators Update, has done away with the Advanced display setting in control panel. Used to be able to change text size in menu bars and icons. Now, the only way to change text is to magnify the entire page. This used to be a good way to selectively change text to make some items easier to read without crowding out the rest. I.e, 14 point boldface in title bars. With my Windows 10 updated, I clicked on the window icon and typed “Advanced display” and was taken right to it. So it’s still there. Hi – I have windows 10 pro and can’t seem to enlarge the text size without making everything larger. I can’t find the slider bar that was in previous versions. This relates to the application development concept of “DPI awareness”. An application can tag itself as aware or not and conduct itself appropriately. By default, I believe, older applications are seen as not aware. It’s my understanding that unaware applications have their output scaled to fit in. But if the app is using certain APIs, it’s internal understanding of the screen-resolution will not match how the OS is scaling it to fit the screen. You may see certain anomalies with some older apps when the DPI is not set to 100%, like tooltips or other popup menus and windows not appearing where they should, etc. There are different levels of DPI awareness for an app, e.g. for fonts and images, and just what it takes to be “DPI aware” is a pretty obtuse topic. I can never get things set the way I like in Windows (10). Older versions used to let you set everything, but not anymore. I leave the resolution setting alone and change the scaling to 125% to make most things at least tolerable. But going any higher with this pushes things off the screen in some apps. I use File Explorer a lot and the fonts are just too tiny for me but no way to change that I can find. I’d also like to be able to change the sizes of the different elements of a window as we used to could do but no joy there either. The more “improvements” Microsoft makes the worse it gets. I tried to enlarge the font size and also change the font. Somehow I’ve really messed up the screen settings, so panels of information on the right side are compressed and the lines crunched up together.